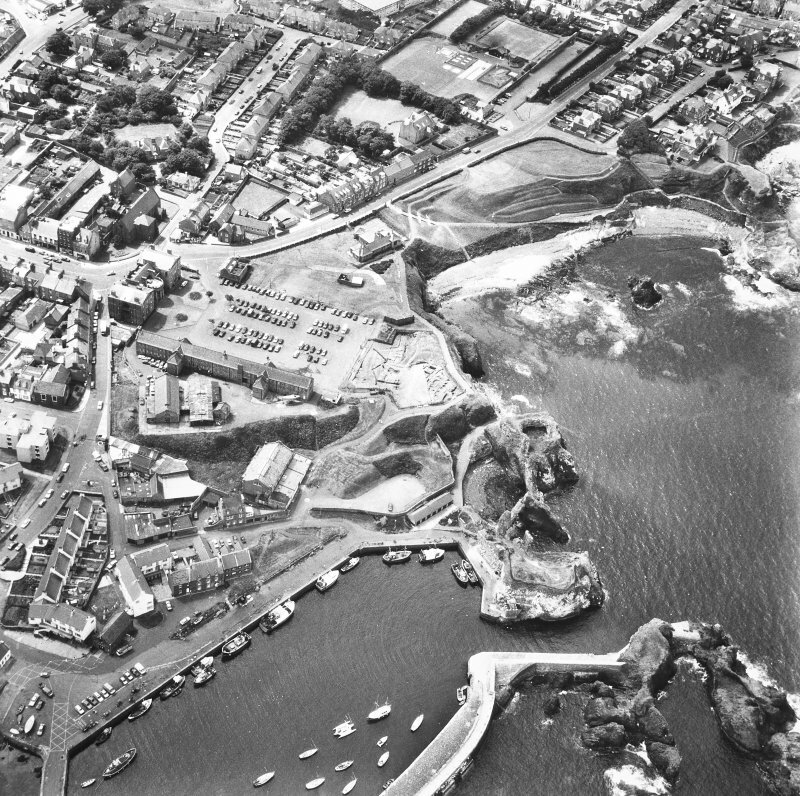 Oblique aerial view centred on the barracks with fishermen's housing at Victoria Place and leisure centre adjacent, taken from the WSW. 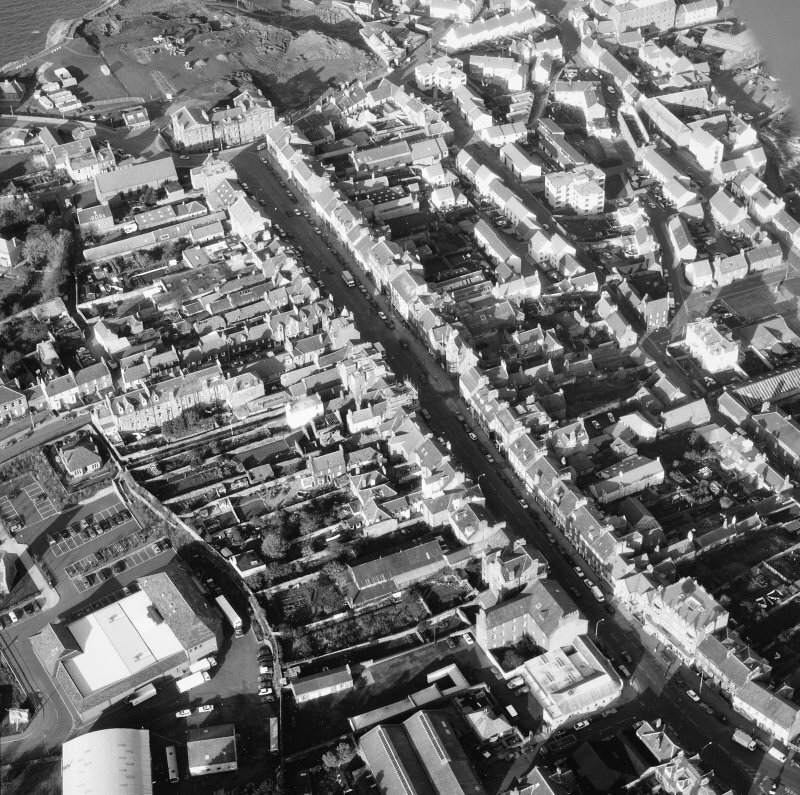 Oblique aerial view centred on the barracks with fishermen's housing at Victoria Place and leisure centre adjacent, taken from the NW. 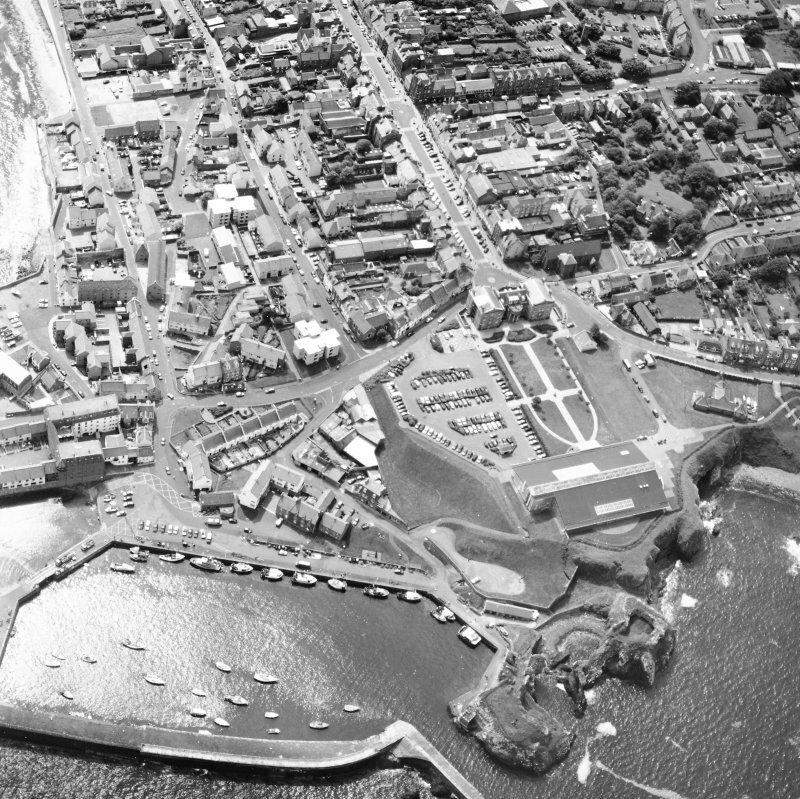 Oblique aerial view centred on the barracks with fishermen's housing at Victoria Place, harbours and leisure centre adjacent, taken from the WSW. 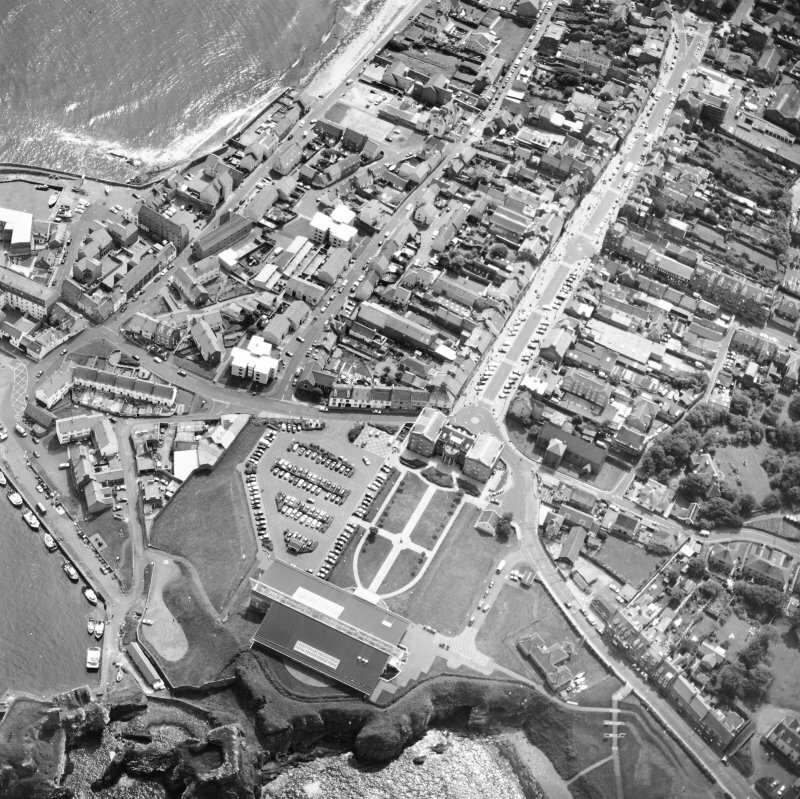 Excavation on this site took place between March-August 1988 in advance of a leisure complex development by East Lothian District Council. 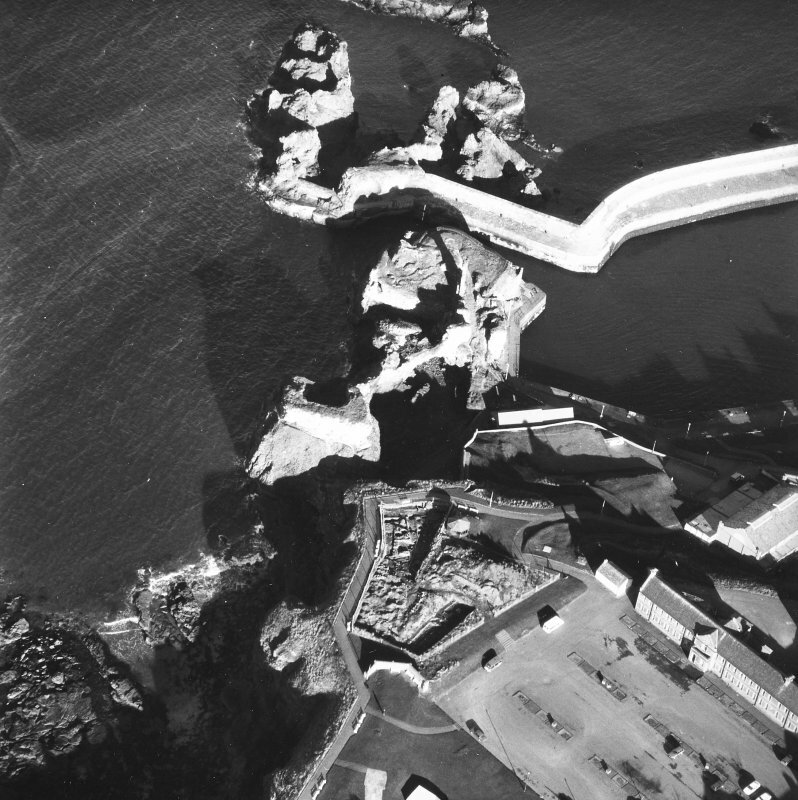 The edge of the defensive ditch of the French fortification of 1550 was located, surrounding a sizeable broken stone courtyard. 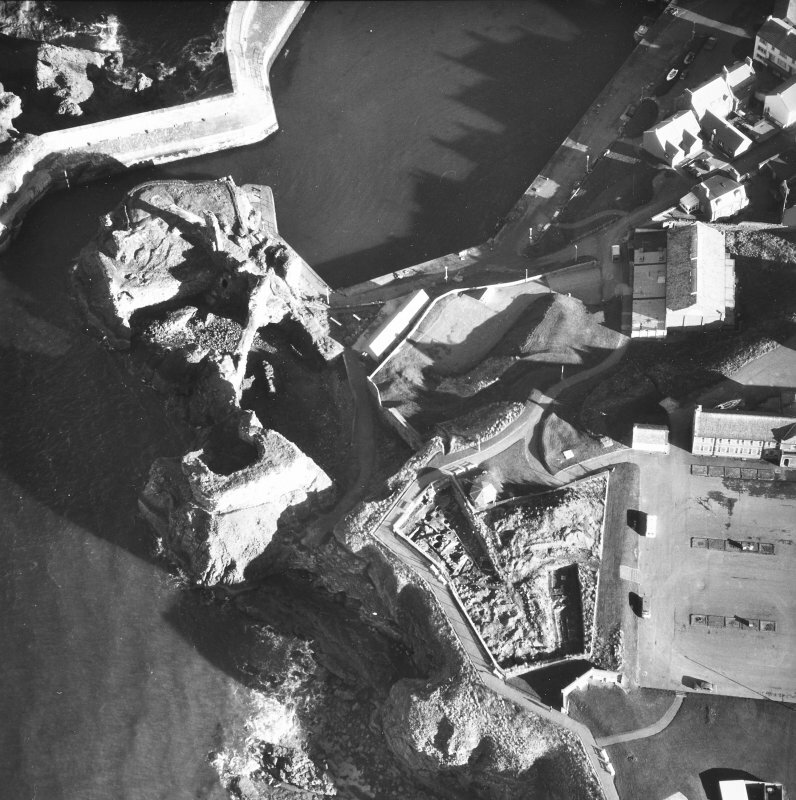 An earlier courtyard possibly of 12th or 13th century date was revealed below the French fort. This courtyard overlay a 2.5m wide sandstone wall running on a NW-SE alignment along the cliff top. An external path or yard was found on the W side of this wall. 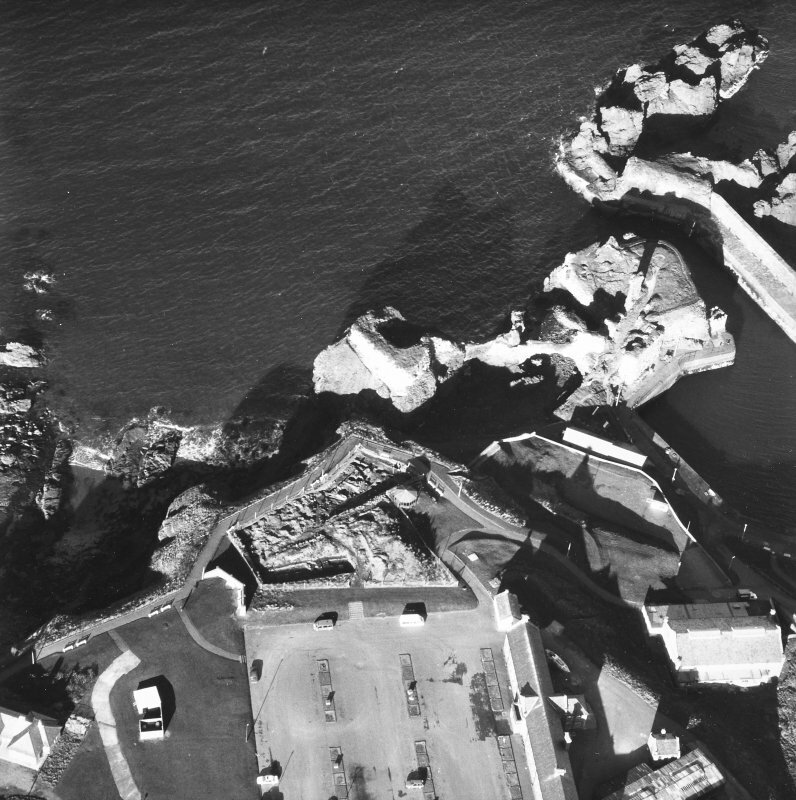 This wall possibly represents a W curtain wall around Dunbar Castle which lies some 85m E of the excavation. The levels below the wall overlay the demolished remains of two stone and one timber building. The most completely recovered building was a rectangular structure with an internal paved walkway and the suggestion of a curved S end-wall. 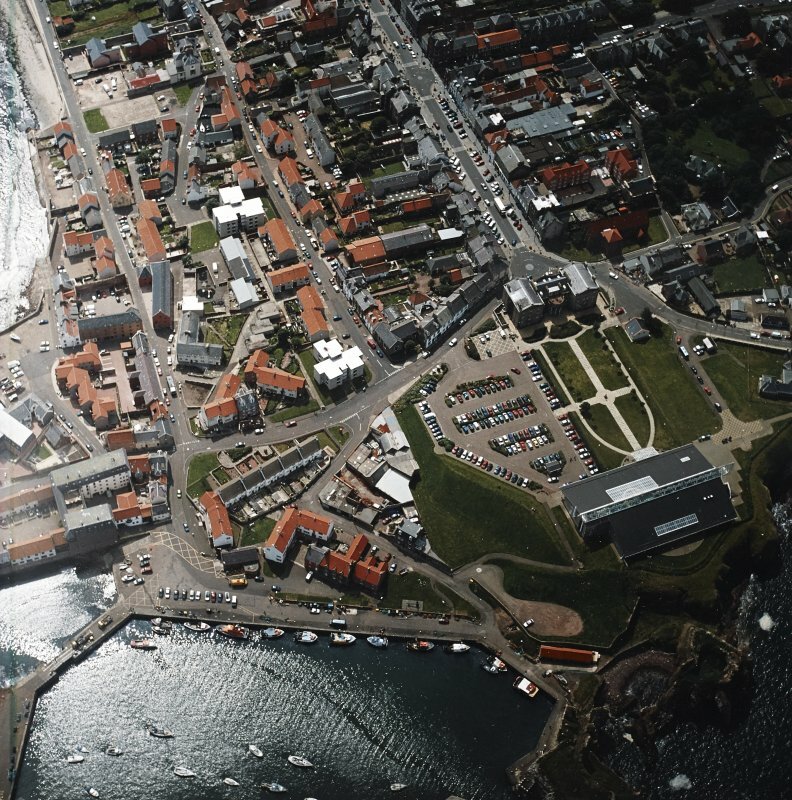 Finds from levels associated with these structures include two Northumbrian styca coins and an Anglo-Saxon sceatta. Other finds include decorated spondle whorls, whetstones and a decorated bone pin beater. There is the suggestion that these finds are all residual and do not indicate a date for the stone buildings. The buildings had been erected on a large area of cobbling that formed a yard surface at the E end of the excavation trench. Below this yard the ground plans of two timber structures were located. The later of the two structures was represented by 3 linear beam slots, one of which contained a gilded bronze book clasp, as yet undated. 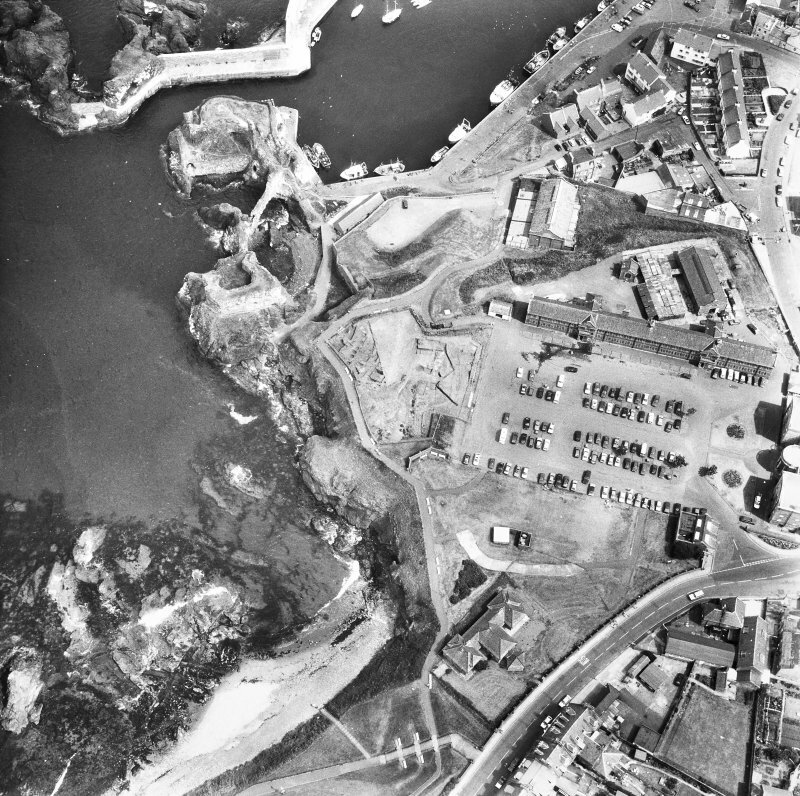 Further excavation took place on this site between October 1988 and March 1989. The W ends of two timber halls of possibly Anglian date were revealed. These halls overlay an earlier stone surface which sealed two substantial ditches running across the headland. C14 dates of 116 AD-449 AD were obtained from charcoal samples taken from the stone surface. 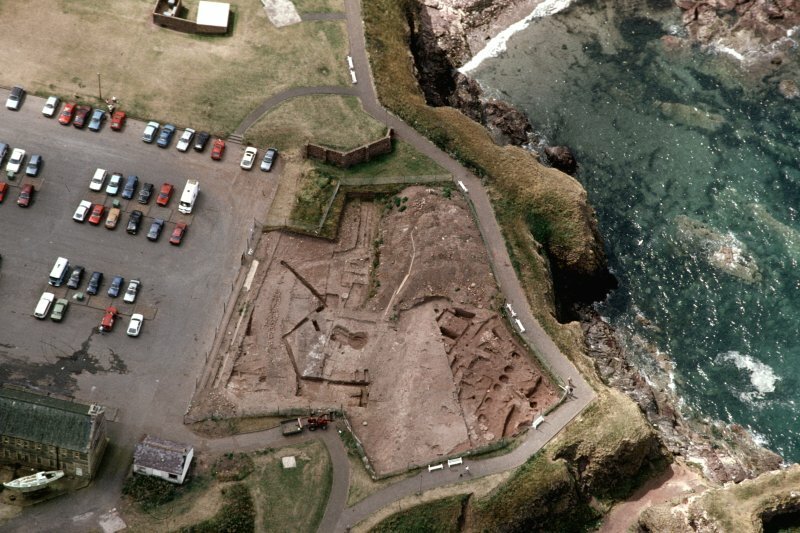 Excavations at Castle Park, Dunbar continued under the direction of Philip Holdsworth. An extensive gravel surface sealed the remains of a medieval stone rampart which had never been completed. Evidence of two more timber structures was uncovered, one of individual post-hole construction, the other of trench and post construction; both may date to the Anglian period. D Hall and P Holdsworth 1989. 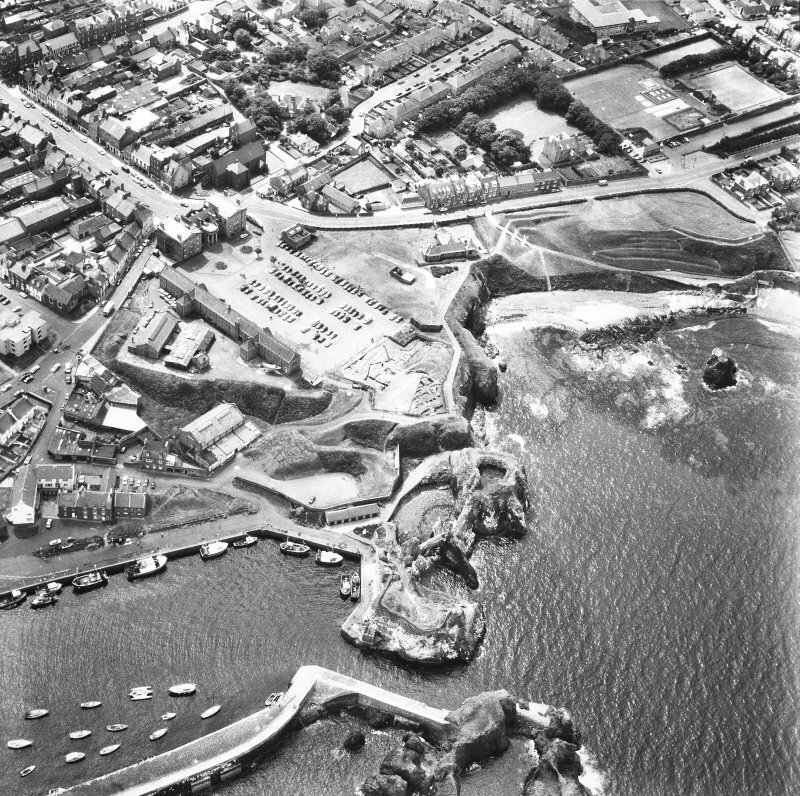 A fourth phase of excavation on the headland took place during November and December 1991. Four main phases of activity were identified. 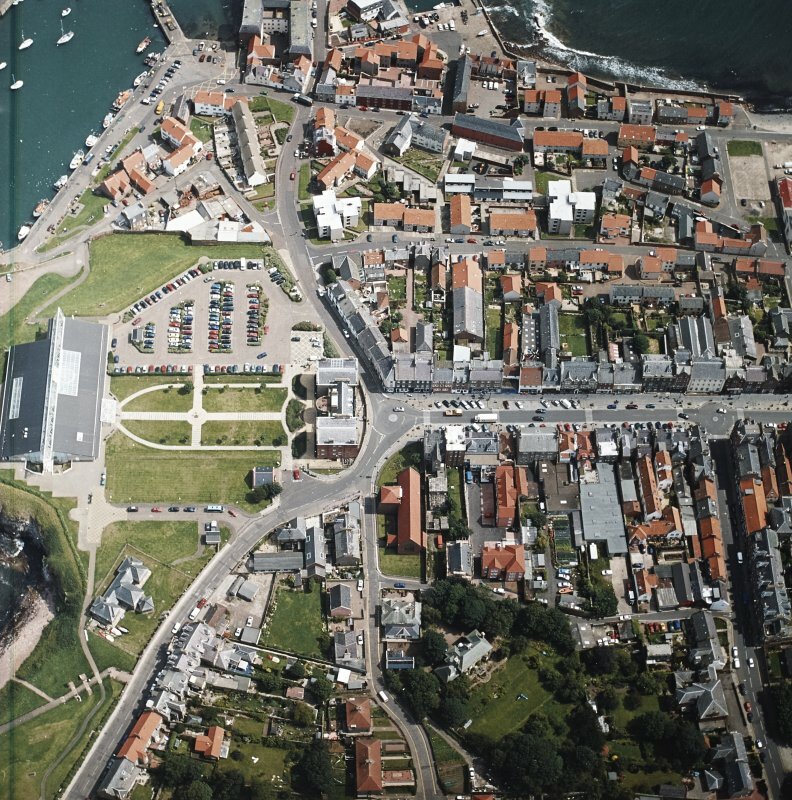 Phase 1: The earliest activity on the site consisted of a N/S ditch which formed part of the Native British promontory fort identified in the earlier excavation. This was followed by Dark Age activity. Phase 2: Dark Age activity consisted of a possible large sunken floored building surrounded by two concentric post-trenches. Unfired clay loomweights were recovered from the floor of this feature. 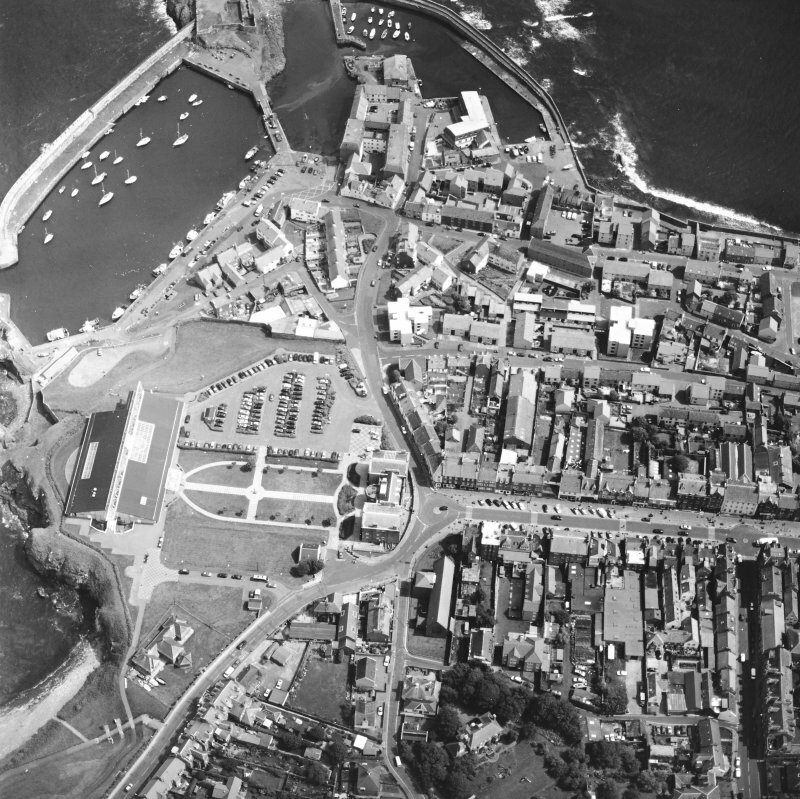 Phase 3: Medieval occupation on the site was associated with Dunbar Castle. the foundations for the curtain wall were excavated as was an associated cobbled surface. 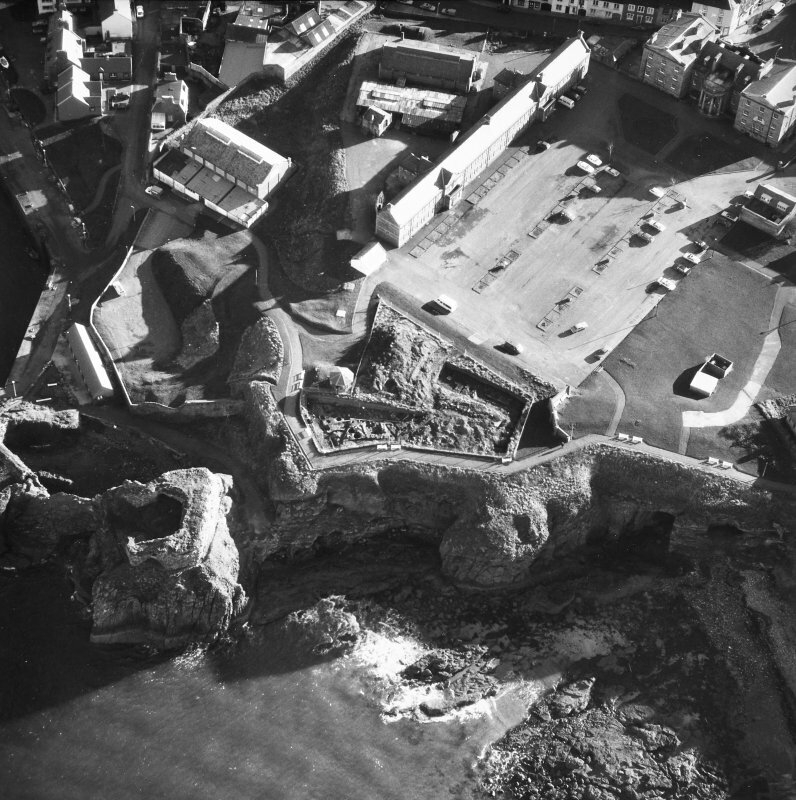 Phase 4: In the early post-medieval period part of the curtain wall was robbed out, presumably to be used in the contruction of the 16th century French fort. 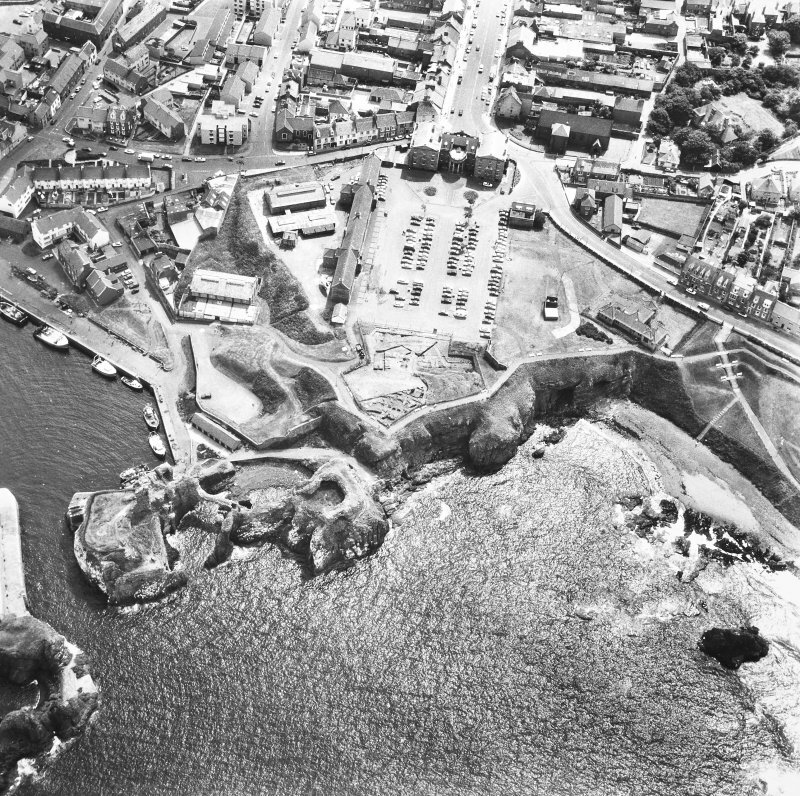 This site falls within the area scheduled as Dunbar Castle Park. Information from Historic Scotland, scheduling document dated 20 April 1994. 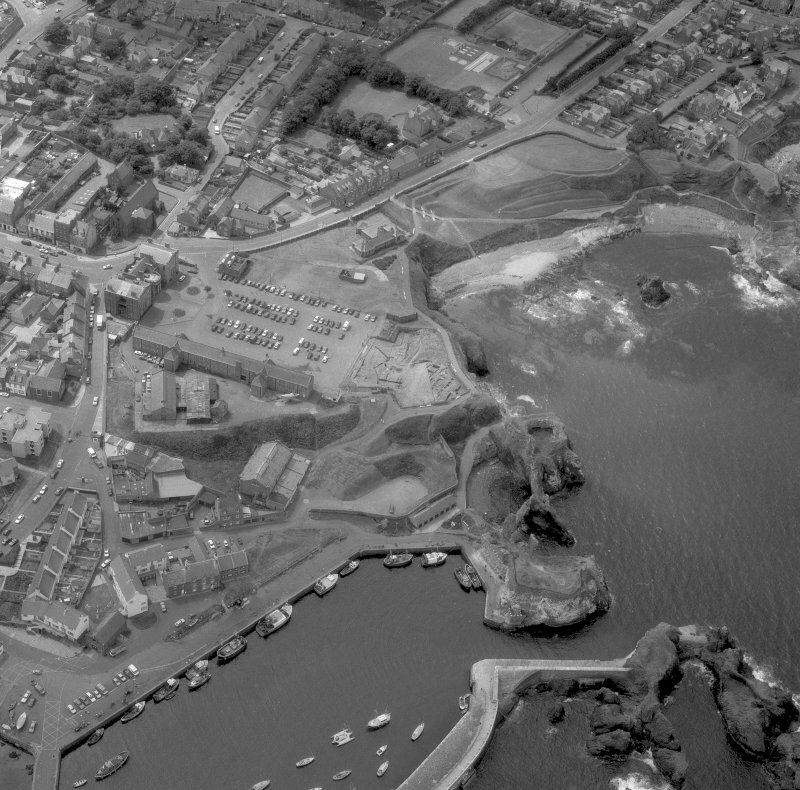 NT 678 792 An evaluation for an amenity block was carried out at Dunbar Harbour in July 2009 on a site formerly occupied by a military gymnasium and ballroom. 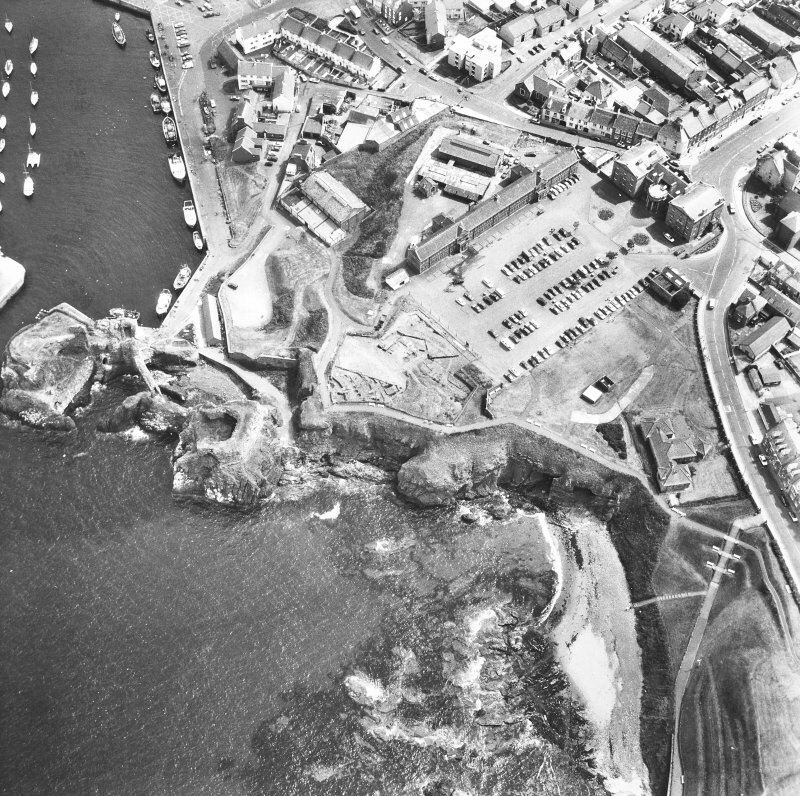 The proposed development area lies in the scheduled area associated with Dunbar Castle. Trial trenching led to the identification of two lengths of wall. 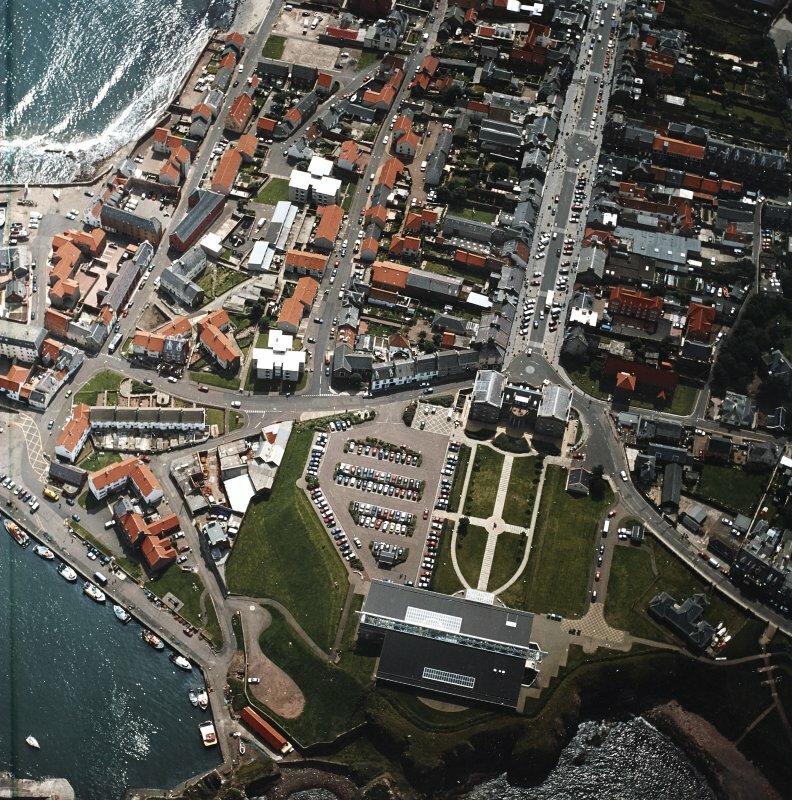 The walls were both of red sandstone and grey granite construction and ran at 90º to one another, suggesting that they may have been part of the same building. The walls were sealed by a deposit containing red sandstone fragments, shell, carbon flecks and fragments of bone. The date of the walls was not established but their nature suggests that they pre-date the military gymnasium and ballroom. It is possible that the walls relate to structures depicted on Roy’s Military map (c 1750), but the scale and quality of the mapping does not allow their exact position to be pinpointed.